This 1/35 scale model recreates the Goliath. It was a diminutive tracked vehicle about 1.5m long that could carry up to 60kg of light explosives and was remotely controlled via 3 cables that spooled out of its rear. Some 7,564 were produced in all, split between 12V battery and gas engine-powered variants. They were largely deployed by assault pioneer (Sturmpionier) units, and were hoped to give the advantage of surprise. They were used on all fronts including German counters to the allied invasions in Normandy. •	1/35 scale plastic model assembly kit set. •	Contains parts to create 2 Goliath tracked mines. Length: 46.5mm, width: 24mm, height: 15.5mm. •	Goliaths feature assembly type tracks. •	Enamel wire is included to recreate the remote-control cable. 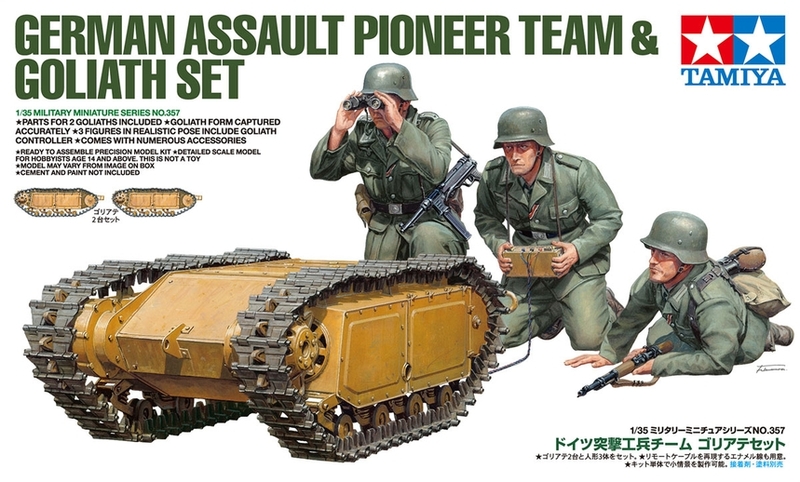 •	Parts are included to create 3 full body assault pioneer team figures in realistic pose, with a kneeling Goliath operator, a commander surveying the battlefield and another soldier taking aim from a prone position. •	Comes with a range of accessories, recreating Karabiner 98K rifle, MP40 sub-machine gun, binoculars, P08 luger holster/magazine pouch, Goliath controller, duffel bag and water canister. •	Note: Decals are not included in this kit.